This is not a big park, but it's got a lot to offer for its size. Some of the singletrack in this park offers beautiful views both to the east and to the west, owing to the position of the park on the spine of the Santa Cruz Mountains. In addition, there are three other neighboring open space preserves around Russian Ridge with mountain biking opportunities in each (Monte Bello, Coal Creek, and Skyline Ridge). So, it's entirely possible to string together your own "mini epic" ride threading through two or more of these. The ride begins from the park's parking lot on Alpine Road, near the intersection with Skyline Boulevard. This decent-sized, free lot can hold over 30 cars, but it still fills up relatively early on weekend mornings when the weather is nice. Some overflow parking on the side of Alpine Road between the parking lot driveway and the intersection appears to be tolerated, which might accommodate another 10 cars or so. If no parking space is available around here, what I would first try is the park's smaller free parking lot that is just over a mile further down Alpine Road and to take Ancient Oaks Trail up from there to connect to this ride route. If that doesn't work out either, the only remaining option worth considering is parking in the neighboring Skyline Ridge or Monte Bello Open Space (which are also free lots) and incorporating some trails of those parks into your ride to reach Russian Ridge. This particular ride traverses all of the bike-legal singletrack at Russian Ridge. It starts out (unfortunately) immediately with a significant climb right out of the parking lot. Ridge Trail gains about 300 feet of net elevation in less than a mile here, with the slope of the grade getting close to 20% in one or two spots, but most of it staying at or below 13%. This trail widens into a full-blown fire road as the grade slackens after the first quarter mile or so. This fire road takes you to some of the highest elevations in the park. Before diving back into singletrack, this route pays a visit to the top of Borel Hill here. This unassuming knoll has the distinction of being the highest spot in San Mateo County. Views open up in all directions from this peak, though the scenery of the ocean is more distant than that of the bay and can often be obscured by a fog layer. Retracing your steps for just a few seconds after stopping at Borel Hill takes you to Ancient Oaks Trail via the short and cute connector called Bo Gimbal Trail. Ancient Oaks Trail is one of the most distinctive trails in this park. The inspiration for the trail's name is very easy to guess as much of the trail is situated in the shade of these beautiful, large oaks. While the stretches of the trail around the cluster of oaks has plenty of minor roots and is quite widened, much of the trail is actually a nicely narrow hillside singletrack that is open to panoramic views facing south, and it doesn't require any exertion. After Ancient Oaks, you string two short fire-road segments together to get to another singletrack climb. This one on Hawk Ridge Trail lasts for almost exactly half a mile and averages a grade of 9.5% end to end. The tougher spots on this climb have a slope around 12% and the trail has a short stretch where it tests you with a 15% grade shortly before it ends. This is the toughest climb on this ride. Hawk Ridge Trail is arguably the prettiest and most scenic part of the ride, though. This is a narrow singletrack that traverses a grassy hillside and is wide open to 180-degree views facing west, all the way to the ocean. The slope of the hillside on which the trail is built actually gets quite steep in some places, so much so that it could be intimidating to inexperienced riders. My advice in such cases, as always, is to simply get off and walk wherever your instincts tell you to. Once Hawk Ridge Trail intersects with the fire road at the ridgetop, which is another segment of Ridge Trail, you continue straight onto the singletrack continuation of the latter on the other side of the fire road. What follows next is a short, scenic section where pretty views of the bay and Santa Clara Valley open up for a brief moment. Then Ridge Trail first dips back into tree cover temporarily and eventually starts a winding, sunny, one-mile descent down the northwestern "shoulder" of Russian Ridge. This is a fun singletrack descent with some gentle switchbacks along the way. This is probably my favorite trail segment at Russian Ridge in terms of riding fun. Even the scenery along this trail segment is not too shabby, though it can't hold a candle to the wide-open vistas of Hawk Ridge Trail. It's also gets rocky at several spots, which adds some fun. 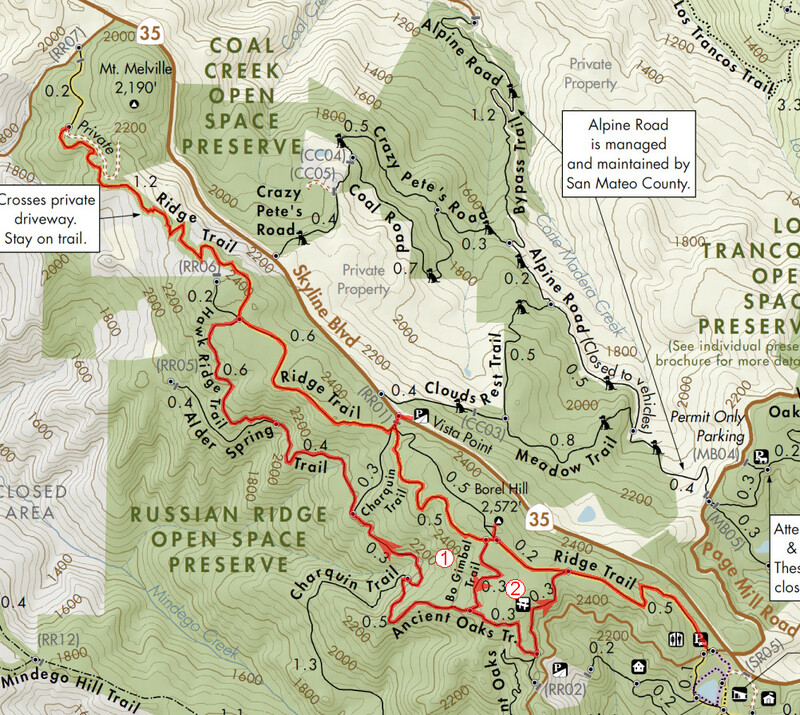 This is the most technical trail you'll find on Russian Ridge (which is not very technical). Ridge Trail eventually ends where it merges onto a gravel road near the northwestern tip of the park. At this point, you have a choice to make. If you're looking for the easiest option you can find, you can follow this gravel road while making nothing but right turns and you'll be on Skyline Boulevard in just over a quarter mile, heading back toward the center of the park on this road. This involves less cumulative climbing and the smooth pavement naturally requires less struggle than muscling back up the few rocky stretches on Ridge Trail might. You can, therefore, save yourself some effort by returning to the quick visit to the vista point on Skyline Boulevard via road. Your other option is to return the same way you came, by repeating the twisty descent on Ridge Trail as a climb, and then continuing onto the fire-road "middle sections" of Ridge Trail to get to the same vista point. On this particular ride, I've followed the singletrack return option from the end of Ridge Trail, which is my preferred way of doing it. This climb still feels like work, but it's not as serious as the climb on Hawk Ridge Trail. There's only about a quarter mile of this return climb where the slope exceeds 10% with any regularity. The rest of it is easier. As I've already mentioned in passing above, the ride then pays a quick visit to a vista point on Skyline Boulevard that's directly adjacent to the middle entrance gate (RR01) of the park. The views from this vista point, ranging from Mount Tam all the way to San Jose, are not that different from the views you would have seen from Borel Hill. But, since the route takes you right by this spot anyway, there's little reason not to take another quick rest stop here. From the vista point, you continue by following another singletrack segment of Ridge Trail. This is another grassy, scenic, hillside singletrack. You traverse this segment in the uphill direction, and I must say that the first quarter mile of this stretch feels like a real climb. The slope ranges mostly between 7 and 10 percent in that quarter mile, though the worst spot gets close to 15%. You complete the larger loop of this route when this trail connects you back to the junction with Bo Gimbal Trail. On this particular ride, I've taken another dip down Bo Gimbal Trail at this point to turn in the other direction on Ancient Oaks Trail this time. This allows you to traverse the remaining singletrack stretch of Ancient Oaks Trail that you haven't earlier on the ride, before making it back to the parking lot. One of the common ways of varying or extending a ride on Russian Ridge is to cross Skyline Boulevard and enter Coal Creek Open Space on the other side. You can do this either via Crazy Pete's Road, which is less than a mile north of the vista point on Skyline mentioned above (make sure you don't enter someone's private driveway by mistake, there are plenty around that junction; Crazy Pete's Road has a Coal Creek park map near its entrance), or via Cloud's Rest Trail whose turn-off on Skyline is just a few hundred feet from that same vista point. (Refer to the park map linked from this page.) Both provide you a brief mixture of fire road and singletrack descent. The Crazy Pete's option has a couple of short and steep bursts of climbing, too. Both will take you down to Alpine Road (a fire road), on which you can turn right and reach Page Mill Road and follow it back to the intersection with Skyline, near the Russian Ridge parking lot. Another option is to cross over to Skyline Ridge Open Space, directly across Alpine Road from the Russian Ridge parking lot. There's actually an underpass to that park directly from the Russian Ridge parking lot, but I believe the trail reached by that one is not legal for bikes. You might want to take the tiny singletrack trailhead just a few feet further west on Alpine Road itself in order to enter that park legally. The third option is Monte Bello Open Space, whose entrance is less than half a mile down Page Mill Road.